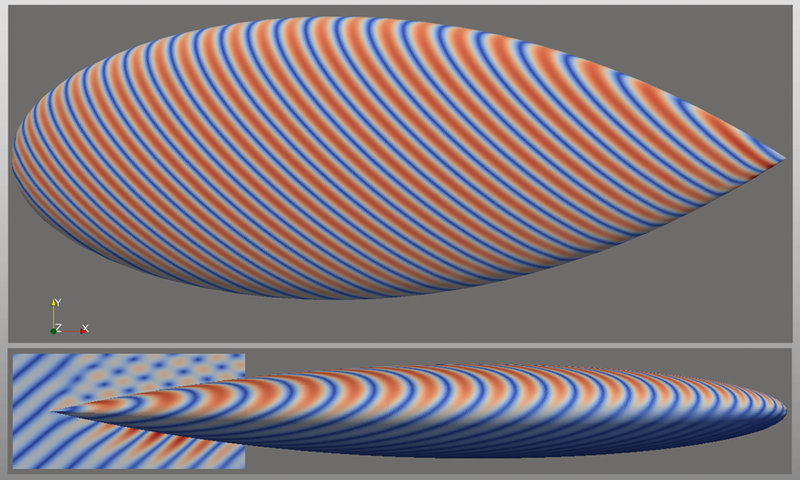 Scattering on canonical shapes is commonly studied to attain understanding of fundamental wave phenomena near edges, high curvature surfaces, and other wave matter interactions. Wave3D tools present vast capabilities for modeling scattering on both electrically small and large objects. Alex C. Woo, et.al., “Benchmark radar targets for the validation of computational electromagnetic programs”, IEEE Antennas and Propag. Mag., Vol. 35, No. 1, Feb. 1993. Fig. 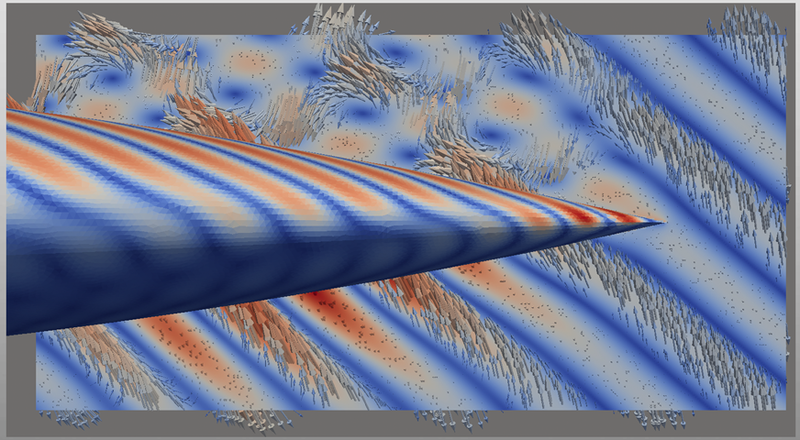 1a: Distribution of current magnitude induced on 25.3cm NASA almond model at 30GHz due to theta-polarized plane wave incident at theta=45 and phi=45 direction (top). Magnitude of scattered of near E-field in the vicinity of the almond’s tip (bottom). Fig. 1b: Close up view of instantaneous scattered E-field distribution at t=0s in the vicinity of 23.5cm long NASA almond at 30GHz due to theta-polarized plane wave incident at theta=45 and phi=45 direction. Fig. 1c: Scattered field of 23.5cm long NASA almond at 30GHz due to theta-polarized plane wave incident at theta=45 and phi=45 direction. 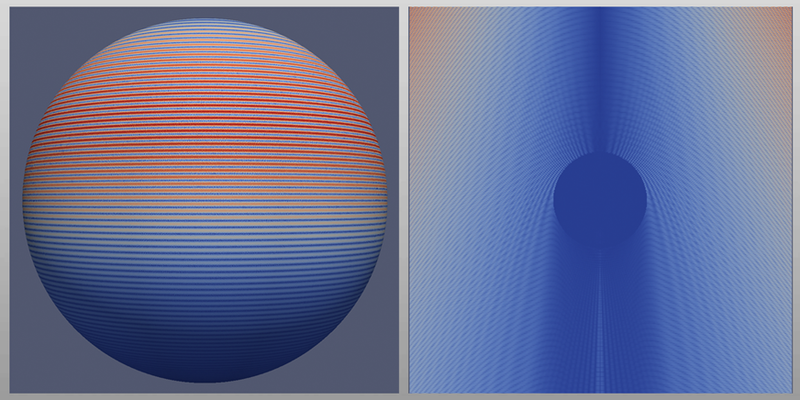 Scattering on a sphere is a standard scattering problem allowing for validation against analytic Mie series. Below are snapshots of current and field at 10GHz produced by radial dipole situated above north pole of 1m radius sphere. Fig. 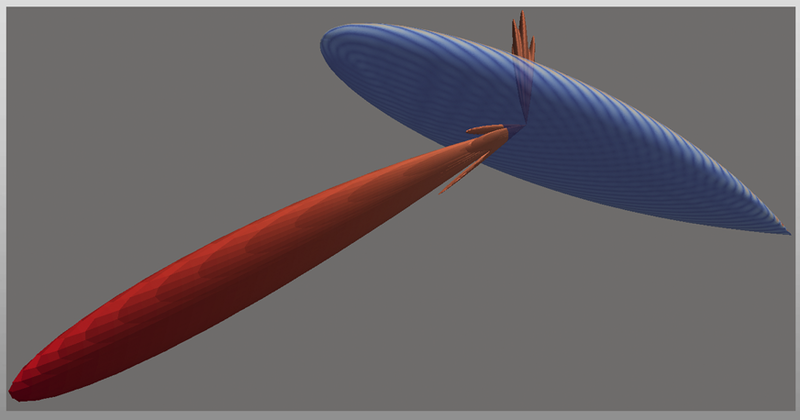 2a: Snapshot of time-harmonic surface current density at time t=0 [s] (left) and the corresponding total field (right) produced at 10GHz by radial dipole situated 9m above 1m radius sphere. The model features 1,224,933 unknowns in RWG Method of Moments solution. Maximum memory allocation during the solution did not exceed 4.7Gb. Fig. 2b: Snapshot of time-harmonic surface current density viewed from the direction of the north pole (left) and south pole (right) at time t=0 [s].